This eco-print silk scarf incorporates three of my favorite dying techniques. 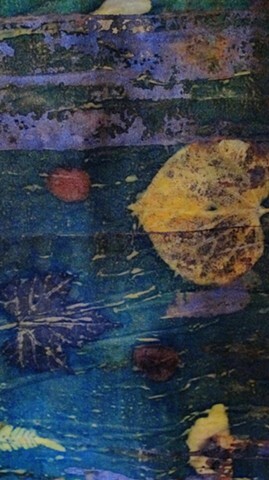 First the silk was dyed with a variety of rusted objects, then echo print dyed with miscellaneous leaves collected from Roanoke Island (blackberry, catawba, eucalyptus, ginkgo, maple, passion flower, pecan, rose, sumac, walnut). The prints were then highlighted with bright acid dye colors, a technique called "medium print', which helps to bring out every detail of the leaves, for a very organic and special unique piece of wearable art.